If you’re in a need of super accurate angle calculations, our new Click board™ can help. 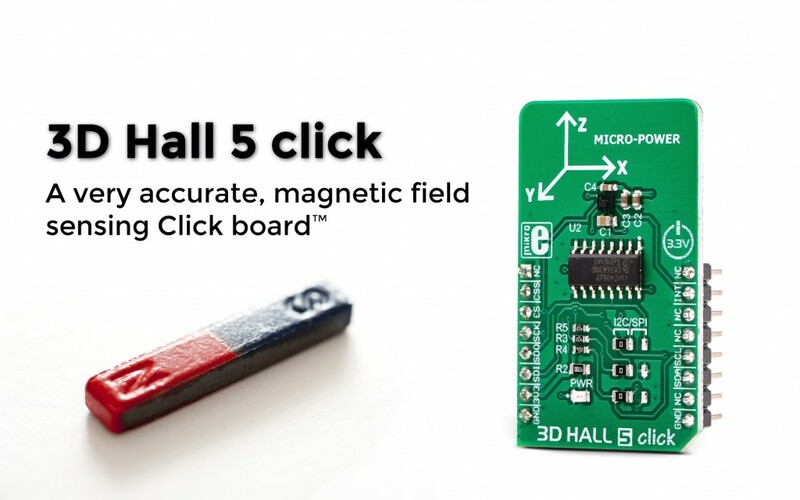 The 3D Hall 5 click uses the IIS2MDCTR, a low power 3D magnetic sensor from STMicroelectronics to sense the magnetic field directions in all three axes. The sensor has a separate Hall sensor on each axis, which allows a very reliable magnetic field sensing in a 3D space, offering a basis for accurate angle calculations. The IIS2MDCTR magnetic sensor offers two industry-standard interfaces: both I2C and SPI communication protocols are supported by this IC. This sensor also features a powerful programmable interrupt engine. Taking the precise angle calculation has never been so easy! For more information about this product, please visit our website.